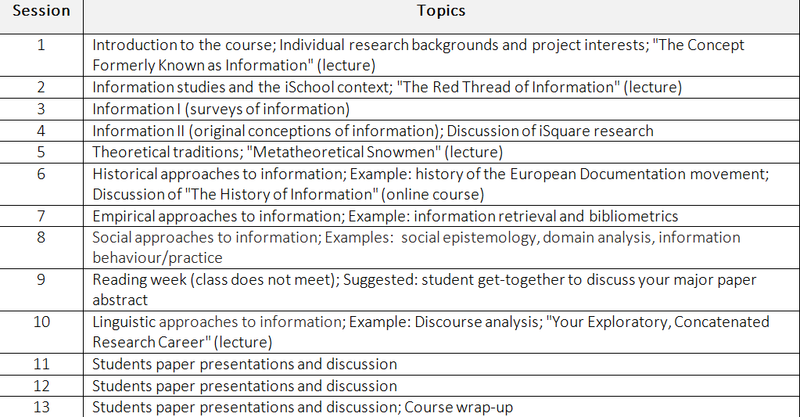 This course is the first in a sequence of three requirements for the doctoral program at the Faculty of Information; here is the Fall 2013 syllabus. An introduction to, exploration of, and examination of the fundamental intellectual landscape of information research. Topics include: (i) an historically, conceptually and methodologically grounded understanding of the use of concepts of information and knowledge across the academy (in philosophy, history, social science, politics, engineering, etc. ); and (ii) contemporary uses of 'information' as a substantial theoretical notion, both in the world in general (e.g., in public political discourse, in such constructions as “the information or knowledge age, economy, society, etc.”), and in such fields as political theory, biology, medicine, computing, etc. The foundations of research in information refer to the "underlying basis or principles" upon which the field of information studies is built. This doctoral seminar explores the foundations of information studies through its history, theory, methodology, and signal concept: information. The origin of contemporary information studies will be traced to the early 20th century and the domains of library science and information science. Four broad theoretical and methodological traditions will be analyzed (namely, historical, empirical, social, and linguistic) as long-standing approaches to information research. The perennial question of the nature of information will be engaged by reading seminal papers and via an original, empirical, visual research project. Throughout, the learning experience will be participatory and collaborative as students lead class discussions and come to appreciate the diverse interests within their cohort. Outside of class time, web-based video resources will be tapped to survey the popular history of information, from the earliest human efforts to communicate through subsequent revolutions involving manuscripts, printing, science, the public sphere, broadcast, and the Internet. At the end of the semester students will be able to locate their own research agenda upon these foundations and embrace a personal conception of information.